The latest PHOTOSONIX technology at your fingertips. 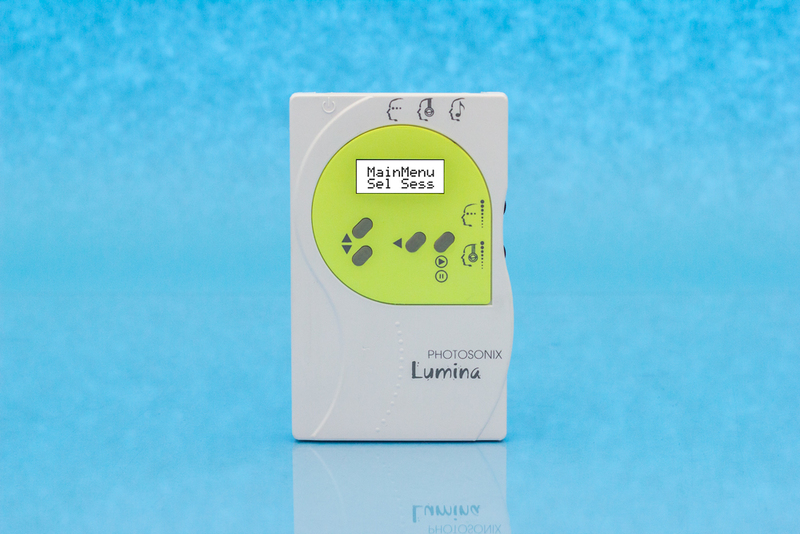 With many sessions to chose from and accurate settings to use, the Lumina offers total control of use for any stress reduction goal. The built in Lithium Ion battery and the USB port allow easy recharging anywhere in the world. Great (16bit) CD quality sound. Compact, very easy to use, at an affordable price. Try it, you will not be disappointed. 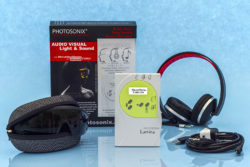 Lumina device, 1 pair of stimulation glasses. 1 pair of excellent PHOTOSONIX Pro headphones, USB cable, USB wall charger, stereo cord, Lumina manual. One year warranty. As always we offer plentiful choices of stimulation glasses. Why? Because not all of us respond to stimulation the same way and we really want you to find your way. Its important. We strongly believe that, not just voice it. Lumina with Standard Glasses $249.00 – In the Standard Glasses category a total of 5 different colors are available to chose from. Red, UltraGreen, CoolBlue, TruWhite and Orange. Single color glasses, are, to this day, still used by many. Which is why we offer such large variety. And best quality, may we add! Lumina with ColorTrack4 Glasses $363.00 – The CT4 glasses are a great way to experience many colors which colors you chose with a click of a button, at your fingertips on the glasses. And, at the same time manage intensity of the glasses during a session with, again, a click of a button. With your eyes closed. We really like that! So does everyone else. 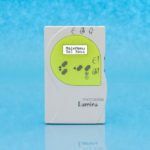 Lumina with hemiStim Glasses $343.00 – For the Professionals who use PHOTOSONIX devices in their clinics we also offer the Lumina with the hemiStim glasses. Total of 6 different colors to chose from, Red, UltraGreen, CiilBlue, TruWhite, Orange and Yellow. The Stimulation glasses now also include a nose piece adjustment set. For those who need a smaller opening at the nose. How to purchase? Click right here and start your journey to a successful and pleasant stress reduction journey. We wish you well and please remember, you can always contact us with questions. 50 Built-in sessions, 36 of which are the popular LightWeave sessions – Including the 50 sessions from the Luma10, the 5 Improv sessions and the 10 very popular DayDreamTM sessions. About LightWeave TM Sessions General information – Light/Sound systems have traditionally had the capability of shifting the phase of light and sound stimulation in 180 degree steps – in and out of phase. With LightWeave technology (first introduced in the Luma 10), phase steps of any multiple of 30 degrees were allowed. This created some fascinating visual effects. By far, the best sine wave modulated lights. About LightWeave TM Continued, forward to now information – In the Lumina, the LightWeave feature has been extended to sound as well, and in addition, delays of a few milliseconds can be specified. It is now possible to determine the proper phasing of light and sound to accommodate the different neural delays of the stimulation, and find the best timing for optimal stimulation. About Improv Sessions – The Improv Sessions present a mixture of stimulation frequencies arranged to be different every time they are played. Based on the late Dr. Tom Budzynski’s “Brain Brightener” concept, they give the brain an always unsuspected stimulation for refreshing and invigorating mental exercise. In 5 different frequency ranges. Session run time – A session may be run at 1/2 to 2 (in steps of 1minute) times its designed time. The display can display up to 2 hours of run time. Session run time adjustment capability – Press BACK during countdown to Session Play. Session time is displayed, use UP and DOWN to adjust. Press BACK or PLAY when the desired time is displayed. Nice, easy. Remaining Session time display – Press BACK during a session to see remaining time. As easy as that:-) Additional BACK actions also cycle through Left and Right frequency, before returning to session name. Informative 16 character LCD display – gives better operator feedback than we have offered on previous machines. And, it is being used to display all of these features. We like that. Precision and range – Stimulation frequencies and sound pitches are available in 0.01 hertz steps (and accurate to better than that). Stimulation frequency can go to 100 hz (we know some researchers working at 70 hz, we wanted to cover needs for many more years). Sound pitch covers 6 octaves, 12 notes/octave of the Just scale with A = 432 hertz, and a session can in addition have up to 6 special pitches specified to 0.01 hertz in the 16hz to 1000 hz range. The timing of individual light pulses is controlled to 8 microseconds and sound to 128 microseconds. Yes, microseconds. Is this accuracy necessary, you ask? In terms of supporting research in the use of exact range of frequencies to be utilized in future stimulation sessions that are more beneficial to you, yes! Very important, actually. Can’t hurt to have it, and it improves session design arrangements. And it sure beats blinking lights only to music like some devices do:-) For this please see the RainbowSoundTM Features below for more. Precision and range continued –The sound system generates true 16 bit (CD quality) sound. Controlled Session parameters – Controlled session parameters – Lumina has control of more session parameters then any other device. Independent light and sound left/right balance controls – one set for the individual with sensory imbalances, another set for the session designer for special effects. Stimulation phase control – light/sound machines have long offered in and out of phase options on the four sensory channels – left and right for both sound and light. With the Luma10, Photosonix expanded this to allow light phases at 30 degree intervals, for the special effects of LightWeave. In the Lumina this flexibility has been added to sound as well, and for the first time, the relative timing of light and sound stimulation is controllable in millisecond steps. We hope an ambitious PhD candidate will use this feature to determine the optimal light/sound timing for entrainment, as the neural delays in light and sound stimulation will certainly be different. Ramping now includes balance and phase – light/sound systems have always allowed stimulation frequency, volume and intensity to be ramped, or changed gradually over the course of a session segment. Photosonix has always allowed pitch ramping as well, and in the Lumina this is extended to include balance and phase. Tones – There are 6 sound tones, utilizing the two frequencies F1 and F2 and pitches P1 and P2. Pulsed Tone – Also known as Isochronic pulses Pitch P1 is pulsed at frequency F1 to the left ear, F2, P2 to the right ear. The selected pitch is pulsed at the selected frequency. The pulsed tones provide a beep beep sound at the selected frequency F1 while the lights are blinking at the F1 rate. Pulsed surf – A surf sound is pulsed at frequency F1. 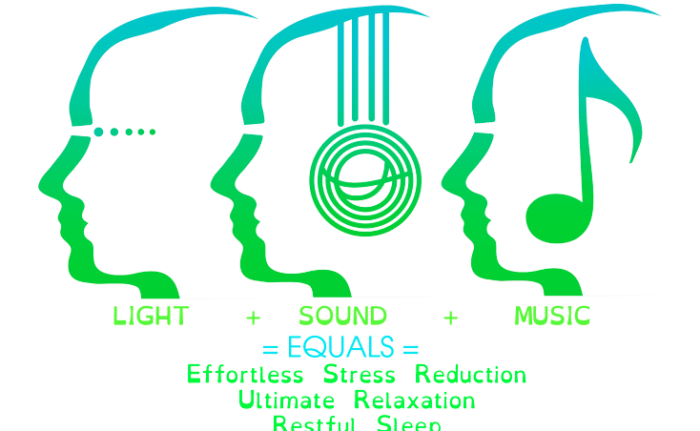 Binaural beats – Binaural beats sends different pitches to two ears (pitch P1 to the left ear, Pitch P1 plus frequency F1 to the right ear) and the sound source direction detection mechanism in your auditory system picks up the difference frequency F1, while the lights blink at the F1 rate. Binaural beats with surf – a soothing surf sound in the background for binaural beats. Try it, relax with summer memories. Dual binaural beats – is a tone selection with two binaural beat generators running at the same time. Each ear receives two tones, so you hear chords or a beat interaction in each ear, plus the four different binaural beat offsets (each of the two left ear tones against each of the right ear tones). This may seem complex and confusing, but it sounds great — dual binaural beats with pitch ramping are a fun medium to compose in and listen to. Pitch – The Lumina pitch range is 16Hz to 960Hz, using the Just scale with A=432Hz, 6 octaves of the just scale, 12 notes/octave to enhance beat frequency. Also, the pitch 2 relative to pitch 1 mode is extended to cover P1 minus 1 to 15 hertz, as well as the P1 plus 1 to 15 hertz provided on the Lumina. The low frequencies have a very powerful effect with the standard headphones, for even stronger effects we suggest the use of more expensive headphones. We have used the Sony MDR-V6, available at around $79.00, with good results. 2hz from 40 hz to 100hz. Plus, a session can have up to 6 special frequencies 1 to 100hz, to 0.01hz precision. Yup, that’s a lot. But very useful:-) The Schumann resonance at 7.83 hertz is also included. Duty cycle – Duty cycle control from 1/8 to 7/8 in steps of 1/8 is provided. Thumbwheel controls – The reason we have them is as not to press up and down switches for a long time to get either sound or light adjusted, we value your time. Now, even easier, the system provides convenient logarithmic thumbwheel potentiometer control of sound volume and light intensity. Total accuracy, total control @ your fingertips. Sound volume and intensity are controlled logarithmically as they should be for human beings, in 20 controlled steps – whenever the volume or intensity thumb wheels are changed, the current reading is displayed, making the setting repeatable. Once a desired comfortable volume and intensity level is found it can be repeated in the future, avoiding constant guessing. Sound Quality – The sound system generates true 16 bit (CD quality) sound, with improved volume range. Bass sound – in addition to the left and right side sound channels, which can be at different frequency and pitch, an optional bass sound is added mixed with both left and right sound for a stabilizing bass background to a session. Greatly improved Gentle on/gentle off – Sessions start with a gradual volume and intensity ramp up to selected levels, and end with a gentle ramp down to off. RainbowSoundTM Features – We Designed the RainbowSound feature with 3 options, one for pure entertainment, one for Light&Sound + music entrainment and one for Light + music only entrainment. We believe in offering choices. Enjoy. When it comes to beneficial entrainment, we would like to caution you about relying on using the entertainment option for entrainment. Why? 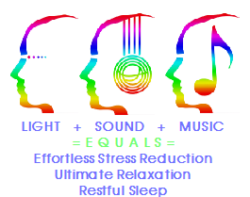 Music is not arranged with specific entrainment frequencies needed for stress management. RainbowSound BrightTM – In the RSB option the lights are under the session control and sound frequencies are mixed with the external sound. This option allows the brightness of the light pulses to be controlled by the external sound giving the entrainment of the session added enjoyment of a pleasurable sound and light brightness in sync with the external sound. PHOTOSONIX light/sound systems have many unique techniques built in, besides always provided sessions with isochronic tones, binaural beats and monaural beats. We strive to have sessions that are both, effective for stress management and also entertaining. About Dual monaural beats – Monaural beats occur when two closely spaced pitches are mixed in the same ear, beats are heard at the difference of the pitches. The dual monaural beat tone, new and unique to the Nova Pro 100 , sends P1 and P1+F1 to the left ear, creating monaural beats at F1, and P2 and P2+F2 to the right ear, creating monaural beats at F2. In addition, the left eye lights blink at the F1 rate, the right eye lights at the F2 rate, for a true dual stimulation frequency experience. With hemiStim glasses the brain hemispheres can be stimulated at different frequencies. About LightWeave TM – Light/Sound systems have traditionally had the capability of shifting the phase of light and sound stimulation in 180 degree steps – in and out of phase. With LightWeave technology, introduced in the Luma 10, phase steps of any multiple of 30 degrees were allowed. This created some fascinating visual effects. In the Lumina, LightWeave has been extended to sound as well, and in addition delays of a few millliseconds can be specified. It is now possible to determine the proper phasing of light and sound to accommodate the different neural delays of the stimulation, and find the best timing for optimal stimulation. About Improv Sessions – Improv Sessions present a mixture of stimulation frequencies arranged to be different every time they are played. Based on Dr. Tom Budzynski’s “Brain Brightener” concept, they give the brain an always unsuspected stimulation for refreshing and invigorating mental exercise. In 5 different frequency ranges. Dual monaural beats and LightWeave TM features – we designed these features as complements to photic stimulation in order to enhance the entrainment process. They sound different, and this is good for eliminating boredom. To keep the mind engaged, sessions must provide some measure of entertainment as well as entrainment. Try them, you will not be disapointed. About HemiStimTM – The Lumina can present different stimulation frequencies to the left and right hemispheres of the brain. To send this stimulation to the left and right brain hemispheres, the left/right sides must be the left/right visual fields instead of the left/right eyes. HemiStim(TM) glasses do this. The Lumina includes some sessions that create different left/right frequencies (so for example the left brain can be energized while the right brain is relaxed). Sessions that do this are marked as hemiStim. The sessions can be used with standard glasses, but will not accomplish the brain hemispheric training effect. The hemiStimTM feature was implemented to help with research PHOTOSONIX supports. Battery saving Automatic shutdown if no session is running and no keyboard action for 10 minutes. Battery – The AA rechargeable Li-ion battery is recharged by a standard micro-B USB connector, same as most cell phones. The charge control circuitry provides safe charging with controlled charge current. Software monitors the battery level and issues charge warnings as recharge time approaches. The system will not start a session unless it is sure it can complete it, if not, a “Low Batt” alert is given. The system will operate at full capability while being charged. Reverse battery protection is provided so the system cannot be damaged by accidental reverse insertion, and the battery cannot be charged if reversed. If an old technology (alkaline, NiMH etc) battery is inserted, the system will not attempt to charge it. The Lumina will not run at this voltage and a “2Low2Chg” alert is given, but will do so when the USB charger is connected. The Lumina also Improved AudioStrobe capability – AudioStrobe* (licensed from Tamas Laboratories) is a registered Trademark of Tamas Laboratories in Germany, who holds the German patent on the technology. Please remember we include the AudioStrobe capabilities in all our devices but we do not offer the AudioStrobe CDs, you will need to purchase those from other sources. The glasses now also include a nose piece adjustment set. For those who need a smaller opening at the nose. The Lumina is very easy to use. Find a comfortable space, chose a desired session, put the glasses and the headphones on, press PLAY, lean back and relax! Once you find your comfort level of the LIGHT Intensity and SOUND Volume, you can always set the Lumina to the same. You can add your favorite music if you wish. In the new RainbowSound features, we offer 3 different ways to do so. Pulsed Tone – Also known as Isochronic pulses. Pitch P1 is pulsed at frequency F1 to the left ear, F2, P2 to the right ear. The selected pitch is pulsed at the selected frequency. The pulsed tones provide a beep beep sound at the selected frequency F1 while the lights are blinking at the F1 rate. Pulsed surf – A surf sound is pulsed at frequency F1. Nice to relax with summer memories. Battery saving – Automatic shutdown if no session is running and no keyboard action for 10 minutes. “I have been using the Lumina for three days now. I like it. I am effortlessly able to reach the point I want to be every time. This is something I was able to do often on the NovaPro 100, but not always. My first program was the Meditate 4. I slipped easily into the state I wanted to be in and have stayed with Meditate 4 for all sessions to date. I may be there for months. I use it 4 1/2 hours a day. Two hours in the morning, two hours in the afternoon, and 1/2 hour before sleep. I would also like to have 2 hour programs available.